No matter how long you grow a vegetable garden, you are never immune to the allure of proud little tomato seedlings that plant themselves in your compost pile, your flowerbed, or maybe the crevices in a stone walkway. One part of us wants to honor the gallantry of tomato seedlings that appear out of nowhere, but we are suspicious. What genes are they carrying? Was their mama a delicious variety you grew and loved, or the one you swore you'd never grow again? The case for keeping a few volunteer tomato seedlings starts with the fact that it's free, fun, and feels like the right thing to do. After waiting so long for spring, pulling up the valiant little darlings and tossing them back into the compost feels a bit unbalanced, which tilts back to right when you give in and say "All right, I'll keep you and you" and start piling mulch around the base of the Chosen Ones. Many gardeners who have done this have been amazed at the hardiness and vigor of tomatoes allowed to choose their own growing spaces, but there is no guarantee that the plant will bear a prolific crop of tasty fruits. However, if you know your garden's tomato-growing history, you may be able to make a good guess based on leaf types. The majority of tomato varieties have what are called normal-shaped leaves, while those with broader, flatter, more pointed leaves have the "potato leaf" characteristic. Some cherry tomatoes have small, finely cut leaves that make them recognizable, too. In my garden, I frequently grow two potato-leaf tomato varieties-- 'Stupice' and 'Brandywine' (which also comes in a normal-leaf version which I have never grown). So, when I see potato-leaf tomato seedlings popping up among the peas, I can reasonably believe that they are one of these varieties. Location can be a clue to the type of tomato seedling you have, too. Volunteer tomatoes that appear where paste tomatoes grew the year before are highly likely to be red plums. Cherry tomatoes are seedy to start with, so they are often well represented in a garden's crop of volunteer tomatoes. This is good only if you want or need more cherry tomatoes. 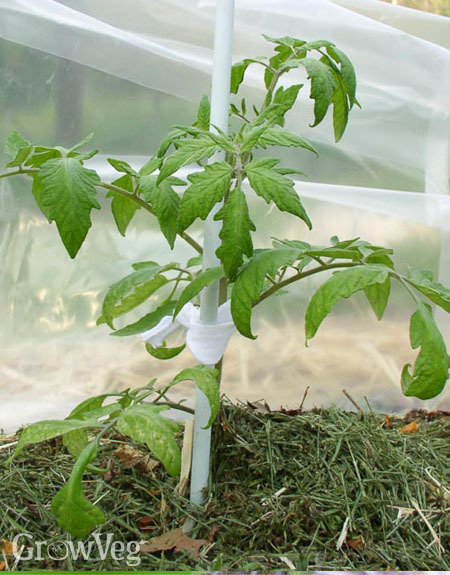 Adopting volunteer tomato seedlings is choosing an adventure into the unknown, which is fine when you have a little space to spare and there are no other victims. When tomato volunteers grow in awkward places like the bean patch or the carrot bed, they must be taken out and the sooner, the better. Vigorous tomatoes can quickly become bullies that overtake smaller crops. 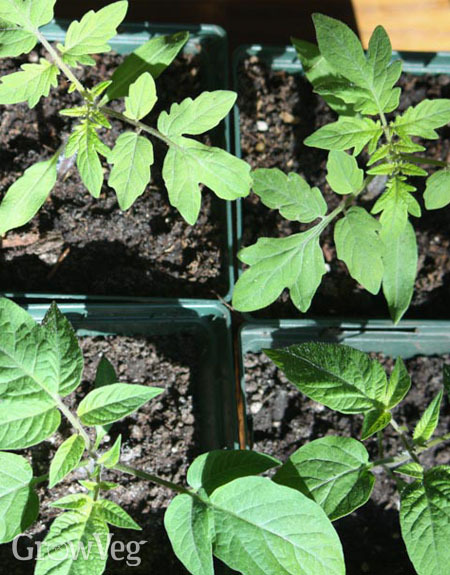 A huge tomato plant can render your compost pile inaccessible, too. After weeks of welcome company, it can turn into an unwanted guest. Then there is the much-touted risk of disease among self-sown tomato seedlings, but I have never heard a first-hand report of a volunteer tomato leading to a disease outbreak in a home garden. However, I often have seen evidence of early blight (dark spots on low leaves) on volunteer tomato seedlings that appear in spring – probably because they grow so close to cool ground, and get drenched daily with dew. For this reason, I pull and compost volunteer tomato seedlings that appear in April and May lest they become a nursery for early blight fungi. Spontaneous seedlings that appear in warmer June weather grow fast and clean, and these plants can make opportune replacements for expired spring crops. Who stays and who goes? With volunteer tomato seedlings as with so many things, the best choices show a blending of head and heart. "Beautifully written, thank you. I have a couple of volunteer tomatoes in my garden, but Im too much of a softy to pull them up. I guess I will ust wait and see how they grow"
"I volunteer at a food bank and we get damaged produce donations often, I typically bring these home to put into my composter and in the spring, will see shoots of volunteer tom. grow from the air vents. One year I rescued those starters to put in my big garden. I had 68 plants to put in with no idea of what and how many varieties I would get. To my surprise I only lost 3 plants, had one orange, pink, two paste tomatoes, three beefsteak-types, three early girl types, and the rest were cherry varieties with one being a yellow cherry. Needless to say the family, neighbors, and the food bank benefited from my bounty, I had plenty to use in my own home in many ways, and I had fresh tomatoes right up till Thanksgiving to enjoy. And they were ALL free! So my vote is a resounding YES to having/saving volunteer tomatoes." "My parents who were lifetime farmers, always said volunteer tomato plants were good. They said they were "climatized". I have moved volunteer plants a foot tall and water them often and they survive. It is true some varieties that are hybrids may go back to the parents. If u have extra space, my advice is to try it. Should be good results Ed"
"I left a volunteer tomato that grew out of the side of our compost bin last year. It certainly took over, but had thousands of the most delicious cherry tomatoes we have ever eaten! The plant covered the compost, and both sides of a 6 ft fence, but the clusters of tomatoes were like grapes. Everyone loved them! Unfortunately, the seeds I kept got accidentally thrown out over the winter." "I have a volunteer cluster of tomatoes. There were about six plants coming up. I thinned them to three and wonder if I should remove another two or leave them alone. They are about 8 inches tall." "Yep, your results MAY vary. I had some volunteers once that seemed very healthy and vigorous, producing an insane amount of fruit around mid-summer, but they had very little flavor. My habit at the time was to plant whatever hybrid varieties were popular and these volunteers were either second-generation or newly-generated hybrids, prolific as all get-out, but really not edible. You just never know what you'll get with sprouts from former hybrid varieties." "Thank you for the article. I have several volunteer plants and yes, they seem to be cherry tomatoes which I love. I was very suspicious about them (never thought that such fragile plant as tomato seems to be can not only volunteer to grow, but more importantly - survive and bring fruits) but now going to try them :)"
"Have a raised bed planted, then self seeded tomatoes grew in thickly...want to move them to another garden...fingers crossed. " "I love the surprise of volunteer tomatoes. Most of them grow from seeds dropped in compost and added to the bottom layer of the garden before it is fully composted. To be sure they are all nice varieties, we only throw tomato scraps in the compost if we liked the original. Sometimes we buy a really yummy variety from the supermarket or a farmers market. I usually cut a slice of the better ones and put it in the garden, covering it with soil. More often than not, something will grow. I won't remember what it is but know it is something we loved. " "Thank you for posting Tomato info. It's always an experiment. I also grow Bell Peppers, usually red yellow or orange. I'm interested in healthy eating. I'm also big on blueberries and cranberries with my vitamins, by the hand full for energy. Wish I knew what to do for my arthritic knee, hip, lower spine, lungs and sinuses. Other than that, I'm in great shape for 67. " "Last year, I planted plum tomatoes (red) and cherry tomatoes (gold). I always plant Seeds for Change or Heirloom varieties because I love volunteers. I think the cherry might have been a volunteer from the year before. This year, I found one little volunteer poking its way up from under a vibrant valerian plant. I gave it a little breathing room, caged it, and much to my surprise, it (in mid-September) is still producing these bright gold, plum shaped tomatoes that are some of the most delicious tomatoes I've ever tasted. I want to continue this line, so I took some of the fruit that dropped and left them over an entire corner of my new garden. Hopefully, they will feel at home there too. But, I'm wondering what is the best way is to encourage the fruit to seedling process? Should I bury them? Should I just learn how to save tomato seeds? Any advice on how to propagate my new, very delicious, variety would be appreciated." "Never seen any volunteer tomato plants in the spring but... However, I found two in mid-October (UK), near my composting bin. (They have been there some weeks for sure, but I was away, so did not notice them) Surprising, as I was unable to grow ANY tomato plants (as usual) the whole summer. And my attempts took place on the other side of the house, about 15 metres away. Anyway, it will be freezing tonight. Should I pull them out and try to overwinter them indoors? (should be warmer than outside)? "